30 in the morning session - 8.50am-11.50am 20 in the afternoon session - 12.30-3.30pm. Our Nursery entitlement is provided as 3 hour sessions, five days a week. This year we are also able to offer some 2½ day places. Our Nursery class children have access to a high quality, play based learning environment organised into workshop areas. The large secure garden and school woodland facilitate wonderful outdoor play opportunities all year round. Currently the Nursery has an excellent staffing ratio of 1 adult to 8 children and the key workers are highly skilled and experienced professionals. The Nursery sessions have a supportive routine which includes opportunities for children to work alone or with others, in child initiated or adult supported play. Children plan their own learning and make choices about what they want to investigate. Staff encourage children to problem solve and reflect on their learning experiences. The Nursery staff also implement Building Learning Power (BLP). This is an approach centred on cultivating "apptitudes" for life-long learning. We aim to encourage children to be resilient, resourceful in their approach to solving problems and to be reflective about their learning. Children can begin to see themselves as learners, and begin to understand that everyone is constantly learning, even adults! On going records are kept of children's learning journey; these are shared with parents regularly. We also benefit from being part of the wider "May Park Community" Many of our children move on to the Reception classes, and have siblings in the school. 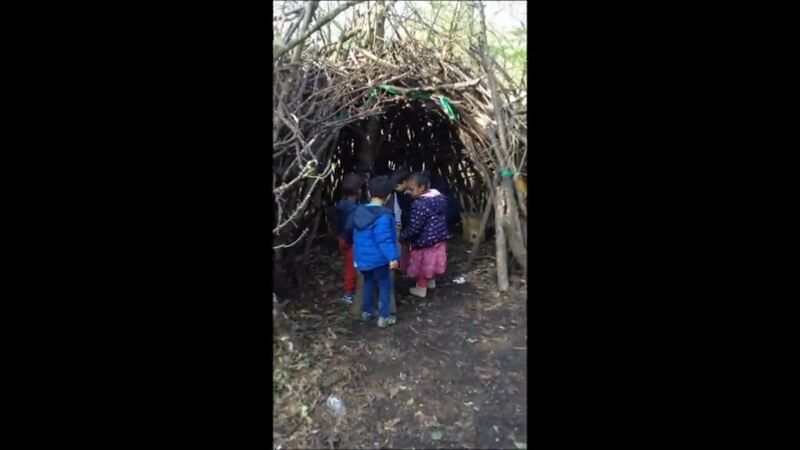 The children have been exploring our woodland for the first time. Crunching through the piles of autumn leaves on the ground, adding huge sticks to structures made by the older children and climbing on the play equipment. During the whole school book week, some of our parents very kindly volunteered to come in and read stories to children in our book corner, in a variety of languages. All the children in the Nursery joined together today for a Christmas party. We played traditional party games such as pass the parcel, the hokey cokey etc, Had a visit from Father Christmas. We sang him Christmas songs, and he brought a gift for the Nursery containing builders tools for role play in the garden. There was lots of lovely food donated by parents, Parents joined us at the end for food, and everybody went home with a chocolate and a balloon. The children found a pot of sand frozen into the tray and collaborated with friends to try to free it. They tried to pull it out but couldn't. One child suggested his daddy was strong and could do it, another child said they should "wait for summer". They all decided to hit it with ever larger spades, and when that didn't work they finally they decided to get wooden hammers, smashed all the ice around the pot, and got it out. "The table is cracking!" one boy exclaimed as the ice cracked. The ice was too cold to pick up, so someone got the toy pliers to pick it up with. As there was only one pair we got out tongs and they used tongs to pick up the ice to fill a bucket. Some of the nursery children took part in a whole school fashion show this week, they wore their own creations; outfits inspired by the story "The paper bag princess," a Chinese dragon costume, superhero outfits, necklaces, handbags and backpacks. The children proudly paraded along the catwalk to the cheers of parents. There was great excitement as our chicks hatched, we had been watching the eggs in the incubator and counting down the days by popping one balloon on our string of balloons each day. We have been learning about growth and change, about which creatures hatch out of eggs and lots of new vocabulary such as "incubator" and "hatch". The children called the chicks fluffy and fluffy two. They have now gone to live in a lovely garden with a mummy hen called Daisy and even some Indian runner ducks for friends. We had great fun dancing around a maypole during our PE lesson this week. We danced round and back, in and out, practicing skipping. The Nursery children and their families had fun taking part in a treasure hunt in the woods on Wednesday. With a map to follow, everyone went hunting for the “X marks the spot!” Hidden in the treasure boxes were Bookstart packs for each child with books in dual languages, colouring activities, and chocolate coins inside for each child. The Nursery children have spent the past two weeks enjoying pirate stories, role playing pirates, making telescopes, treasure chests and boats. In the Nursery we have been learning about Diwali, the Sikh and Hindu festival of light. We acted out the story of Rama and Sita with puppets and have been exploring light with candles and divas. We made rangoli patterns with coloured rice, practiced our emergent writing in Diwali cards, sorted bangles, dressed up and had party food. In the afternoon one of the dads very kindly played his drums for us and let us have a go too. On a cold and frosty morning, Bernadette and Jenny took a group of children to the woods to make hot chocolate. The children helped collect small sticks for the fire, and mixed the chocolate powder into their hot water and milk. After their delicious warming drink they worked together collecting huge sticks this time, to build shelters. We filled tree shaped silicone moulds with bits from around the garden (sticks, leaves, flowers, sycamore seeds etc.) We filled them with water, put in a piece of string with the end hanging out, and placed them in the freezer overnight. In the morning we hung the trees in the garden and watched as they melted, dripping and sparkling in the sunshine. Some children caught the drips on their hands or tongues, some just watched or touched them, commenting on what they saw and felt, and returning throughout the session. We have been learning all about the Chinese New Year, which this year is the year of the rooster. We learnt how to use chopsticks, made red prosperity envelopes with shiny pennies inside. We tried to do some Chinese writing, heard the story about the animals' race to decide which order the years should be named. We read lots of stories about families celebrating the new year and about roosters (or cockerels). We watched videos of Chinese lion and dragon dancing, then ended our celebrations by doing our own dragon dance around the school, making lots of noise with cymbals, drums etc. And of course with party food including prawn crackers and fortune cookies. We came to school wearing our red clothes and did lots of red activities. Some children bought red noses and others had their noses painted red with face paint. As it was St George's day at the weekend we have been listening to lots of stories about knights, dragons and princesses, including of course the story about George, the brave knight who rescued the princess Cleolinda from the dragon. We have been playing with small world castles, dressing up as dragons, knights and princesses and making swords, crowns etc. We even saw some real armour and acted out the story of George and the dragon. We were very excited to watch as our caterpillars turned into butterflies this week. After watching them for a while we took them into the garden and let them fly free. Thank you to everyone who supported our bike ride and cake sale today. The bunting was out, children brought their own bikes or borrowed Nursery trikes to ride around the school, with parents and all of the older children in the school cheering them on their way. A great day was had by all, hardly anyone noticed that it was raining and we raised over £150 to buy new equipment for the Nursery.